They're low in salt and have a good potato flavor. I'm partial to wide ripples, and the wide ripples on these give them a good crunch. 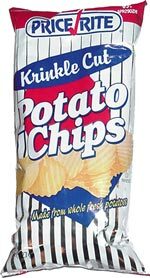 It seems like Price Rite doesn't fully peel their potatoes, becauuse some of these chips are dark or green at the edges, but that gave the chips some character and didn't detract from the taste. Trivia: This bag was a great value for 69 cents.